Betampona Natural Reserve is a small low elevation rainforest (2,228 hectares) in eastern Madagascar surrounded by farmed and degraded land. 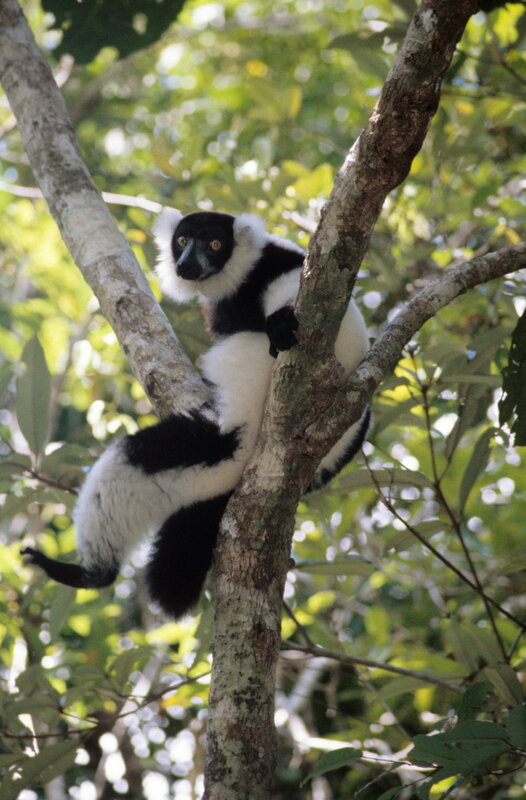 It is home to a variety of lemur species, including black and white ruffed lemurs, Varecia variegata. Compared to other similar sites, Betampona’s population of “Varecia” was lower than expected, which prompted the idea to restock the forest with captive born lemurs and assess the feasibility of a reintroduction program using captive born lemurs. After going through a state side boot camp at Duke University Primate Center in North Carolina, selected captive born “Varecia” were transferred to Betampona where they underwent a 30-day quarantine and adjustment period, prior to being released into the forest. Once released into the forest, they were closely monitored by the project’s research team. Graham was asked to be the field veterinarian for the project, and in this role in 1997, he accompanied the first group of five lemurs from Duke to Betampona, supervising the quarantine period, pre-release health examinations, and post-release monitoring period. Both Graham and Susan accompanied the second group of four lemurs that was transferred in 1998, and on this trip, Susan was pulled away to perform health assessments on highly endangered plowshare tortoises (Astrochelys yniphora) at the Durrell Trust’s Ampijoroa Reserve in western Madagascar. Graham accompanied the final group of four that was transferred in 2000. Of the 13 lemurs that were transferred, five survived and integrated into the wild population, one did not adjust appropriately and was pulled out of the reserve, and the remaining seven died from predation, falls or unknown causes, or were otherwise unaccounted for.